The closeout merchandise retailer is producing higher profits again after a depressing four-year slump. Big Lots' (NYSE:BIG) stock is up 15% over the last three months, thanks in part to good news in the retailer's fourth-quarter earnings report. Sales improved for the eight straight quarter, and earnings were surprisingly strong. Big Lots has a unique approach to retailing that sets it apart from many of its rivals. With that in mind, let's take a closer look at what makes this company tick. Annual let income: Source: Company financial filings. After four straight years of declining earnings (exacerbated by a failed expansion into Canada), Big Lots finally returned to profit growth in 2015. Even better news for investors, though, is that those net income gains have been powered by a return to consistent revenue growth. The company has posted eight straight quarters of comparable-store sales growth following a two-year slump in 2012 and 2013. The latest annual comps growth of 1.8% trailed Target's (NYSE:TGT) 2.1%, but beat Wal-Mart's (NYSE:WMT) 1.2%. Importantly, Big Lots managed that result without any contribution from e-commerce, which is boosting both Target and Wal-Mart's growth figures. Big Lots' inventory tends to change frequently, which is one of the drawbacks of relying on closeout merchandise to deliver hefty savings to customers. Still, it generates revenue from a diverse range of products -- everything from food to consumer electronics. Furniture is Big Lots' largest and most profitable product category. Source: Company financial filings. The company's single biggest product segment is furniture (accounting for 22% of sales), and it's also the one responsible for almost all of Big Lots' recent growth. In 2015, the furniture division jumped 8% higher, offsetting drops in consumables, seasonal, and consumer electronics. Diversity is good for this business, but Big Lots' tends to succeed, or fail, based on furniture sales. The holiday season is important for most retailers, but for Big Lots, it is absolutely critical. The fourth quarter accounts for slightly more than 25% of sales, but is responsible for generating nearly two-thirds (64%) of profit for the entire year. As a result, the risks to the operation all spike in the final three months of the year, when it's important that the management team execute on its inventory management goals while doing its best to keep customer traffic humming without slashing prices too far. 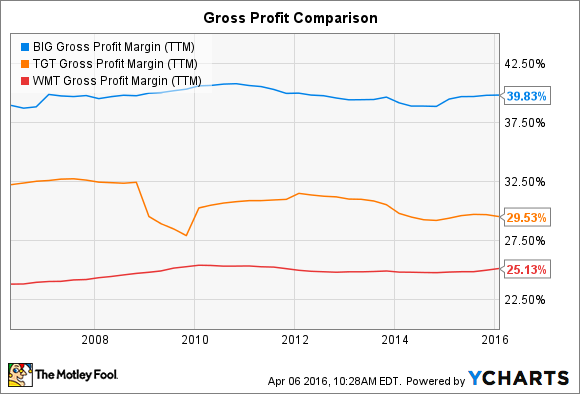 Yet Big Lots' operating expenses are higher than either Wal-Mart's or Target's, which is why its net profit margin significantly trails those larger competitors. In 2014, Big Lots initiated a quarterly dividend payment, and has subsequently raised that payout twice. But management clearly favors stock buybacks as the main channel for returning cash to shareholders. The retailer spent over $200 million in each of the past two fiscal years repurchasing shares, compared to about $35 million in dividends. 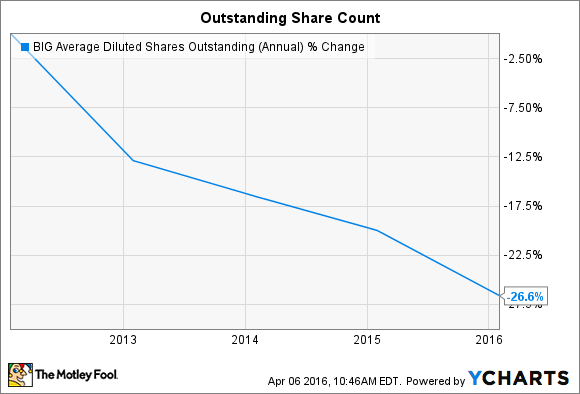 As a result, Big Lots' outstanding share count is plummeting, down by a quarter in the last five years. The shrinking pie helps explain how earnings per share have only slipped by 7% since 2011, even though net income is down 31% over that time. Investors can expect that trend to continue: Management aims to deliver almost $300 million to shareholders in 2016, with the great majority of that that total dedicated to stock buybacks.